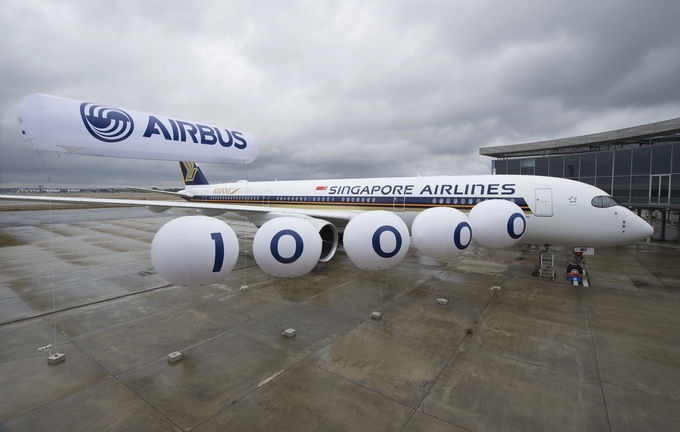 Airbus today celebrated the delivery of its 10,000th aircraft – an A350-900 for Singapore Airlines. The milestone event was marked by a special ceremony in Toulouse hosted by Airbus Group CEO Tom Enders and attended by Goh Choon Phong, CEO of Singapore Airlines. The aircraft delivered today is the sixth A350-900 for Singapore Airlines, out of a total order for 67. Featuring a special “10,000th Airbus” logo, the aircraft will be used to launch the airline’s new non-stop services between Singapore and San Francisco later this month. The 10,000th Airbus delivery comes as the manufacturer achieves its highest level of production ever and is on track to deliver at least 650 aircraft this year from its extensive product line. These range from 100 to over 600 seats and efficiently meet every airline requirement, from high frequency short haul operations to the world’s longest intercontinental flights. Singapore Airlines placed its first order with Airbus in 1979 and over the years the carrier and its subsidiaries have ordered every successive model produced by the manufacturer. Today the mainline carrier operates the A330, A350 XWB and A380, while its regional subsidiaries Silkair and Tigerair fly aircraft from the single aisle A320 Family. Airbus delivered its first aircraft, an A300B2, to Air France on 10 May 1974. Initially working exclusively in the widebody sector with the A300 and A310, the manufacturer moved into the single aisle market in the mid-1980s with the launch of the best-selling A320. Setting new standards in aircraft design, technologies introduced on the A320 were subsequently incorporated on the A330 and A340 in the early 1990s, marking the first time that single aisle and widebody aircraft benefitted from similar operational characteristics. This high level of design commonality is unique to Airbus aircraft types and has been retained across the company’s product line ever since, including on the double deck A380 and the all-new long range A350 XWB which entered service last year. Through the company’s process of continuous product improvement, the Airbus product line has been regularly enhanced over the years with each subsequent development bringing significant benefits in terms of fuel efficiency, operational reliability and passenger comfort. In recent years this has recently seen the company invest in the A320neo Family, which entered commercial service this year, and the A330neo Family, currently in development and with first delivery planned for the end of 2017. Also under advanced stage of development is the second version of the all-new A350 XWB, the A350-1000, which is set for first flight before year end and first delivery in the second half of 2017. Together, the members of the A350 XWB Family are redefining long haul travel in the larger twin aisle market, consuming 25 per cent less fuel and bringing new levels of passenger comfort, with more personal space in all classes. The current Airbus product line comprises a total of 16 models spread across four aircraft Families – the A320, A330, A350 XWB and A380. Airbus has recorded over 16,700 orders for its various models and its aircraft are flying today with more than 400 airlines worldwide. The company’s backlog of 6,700 aircraft on order for future delivery is the highest ever recorded by any aircraft manufacturer and represents some 10 years of full production at current rates.